If you would like to partner with us , call us at +919811979598 or email : events@railanalysis.com . This Summit is to honor the companies, professionals and individuals, who have demonstrated their creativity, innovative solutions, excellence and expertise in the railway and metro sector . As the most prominent Media covering the Rail and Metro Sector in India , The Rail Analysis Summit 2019 is an event to celebrate and honor the known and unknown companies with innovative technologies & products from companies that have taken the Railway Industry to new heights . 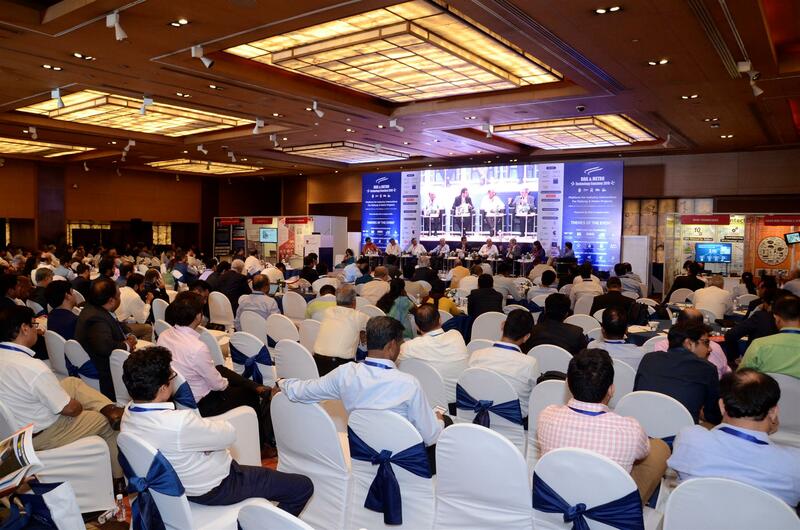 1) Rail Conference : A leading programme of conference sessions and panel discussions providing expert insight into rail and metro opportunities in India . 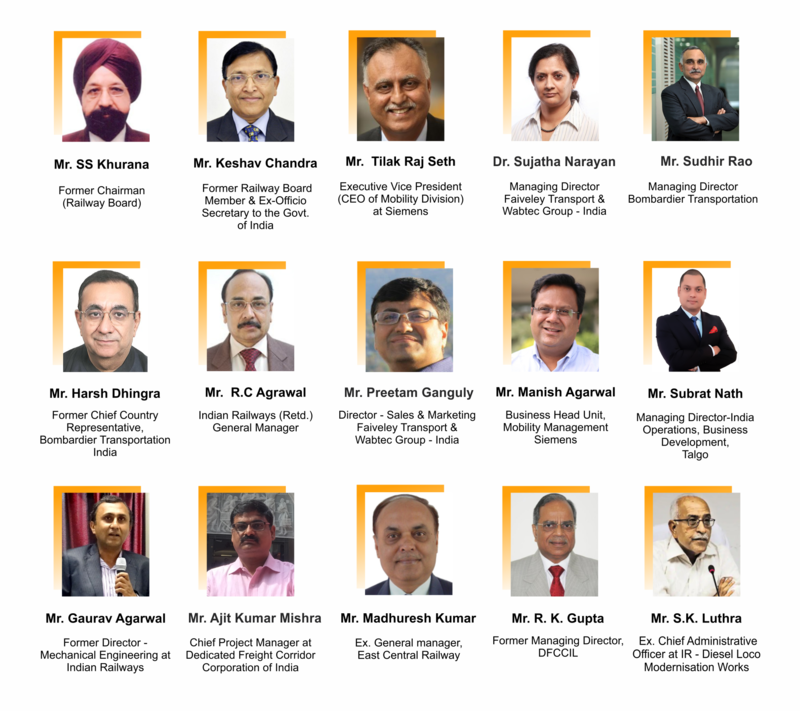 2) Networking : An exclusive networking platform for 250 + Rail Industry Leaders and participants to connect during networking sessions . 3) Awards : Celebrating excellence in Rail and Metro Sector . 4) Exhibitor Showcase : With 10 exclusive stalls and sponsorship opportunities , Rail Analysis Team invites you to showcase your technology to find opportunities and meet key rail and metro stakeholders. We seek to Recognize and Reward excellence in different dimensions of the highly complex railway businesses. It is designed to honor the companies, professionals and individuals who have demonstrated their creativity, innovative solutions, excellence and expertise for the betterment of the railways and metro in India . >> Get extreme recognition in your business capabilities. >> Add more power and value to your brand. >> Showcase your Innovative strengths and achievements. >> Let the world know, who you are. >> Stand out above your rivals and your competitors. The objective is to bring together the India’s largest Railway Decision Makers, Companies and Associates on one common platform who will get the most prestigious recognition for their performance, new ideas and achievements. It is one of the most important occasions offering over 250 finest companies - the chance to meet each other, network with industry leaders. 1) Once the Nomination time is over ( 10th December ) , The Voting Process Shall begin . 2) After Scrutinisation and Tabulation of all the applications by our team , We shall invite all nominees to vote for shortlisted companies in each category so that there can be a Fair Cross Voting Process . 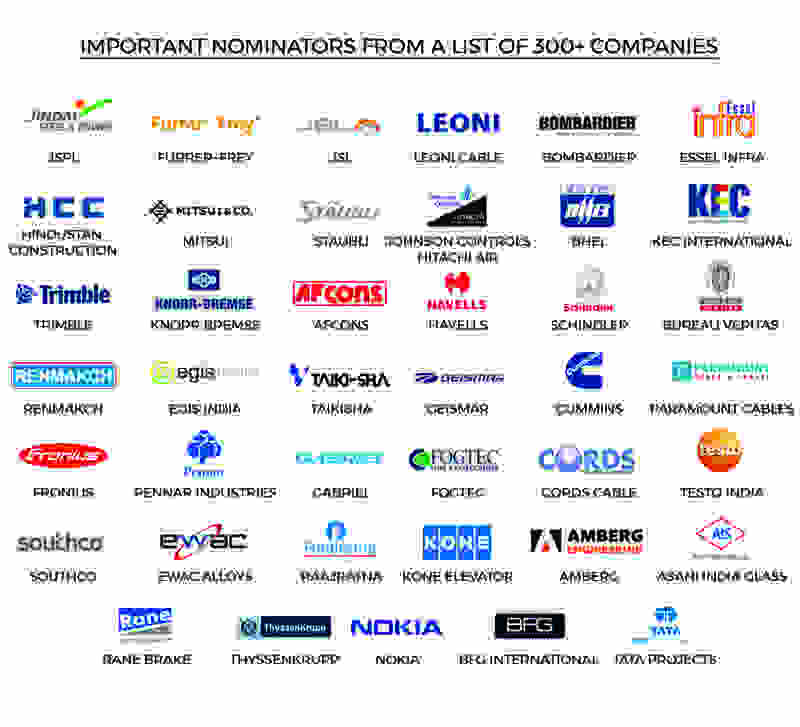 3) We shall Contact all companies who nominated or shortlisted and requesting each company to vote anyone potential / deserving winner for each award in every category . 4) Identification of the winner having maximum number of votes / nomination cast by fellow nominees . 5) Announcement of the Winners shall be on 23rd Jan 2019 . Specialization in your area of Expertise . Consistency in Quality and Continuityof the Brand . Applications for this Award category is open for all suppliers and solution providers in the rail and metro sector in the Indian market that that have continued their operations at the highest level and achieved Excellence in their field of expertise. This award is for excellence in signaling solutions , supply of products and services . The Company must be a provider of End to End Signaling Solutions , Supplier of Products or Services utilized in Signaling Projects . Nomination is Closed! This award is for excellence in marketing and branding of products in the Rail and metro sector through multiple marketing campaigns for a new or existing product / service . The Company must have spearheaded an interesting / creative message about its product / service through numerous marketing campaigns for its end users in the rail and metro sector . They should have been marketed through various rail events / exhibition participation , magazine advertising and articles. The focus shall be on the creativity in the message and the end goal . Nomination is Closed! This award is for excellence in civil engineering & infrastructure development in the rail and metro sector . The Company must be a Civil Engineering Company / Contractor active in the rail and metro sector of India . They must be involved in latest rail and metro projects including construction of new projects , stations , lines , doubling or track renewal projects . Nomination is Closed! This award is for excellence in supply of CCTV Systems or Installation and Commissioning of CCTV Systems . The Company must be a CCTV System or Component Manufacturer or In charge of Installation, commissioning and maintenance of CCTV systems . Nomination is Closed! This award is for excellence in supply of Interiors for Rail and Metro Coaches . This award is for excellence in supply of Fire Security Systems or Installation and Commissioning of Fire Security Systems . The Company must be a Fire Security System provider or Component Manufacturer or In charge of Installation and Commissioning of these system as per the stringent Railway standards / norms. Nomination is Closed! This award is for excellence in supply of Bearings for Rail and Metro Coaches. The Company must be a manufacturer of high quality bearings for the rail and metro coaches . Nomination is Closed! This award is for excellence in supply of Track Machinery for Rail and Metro Projects . The Company must be a manufacturer of track machinery for installation or maintenance of old and new tracks for the rail and metro projects . Nomination is Closed! This award is for excellence in supply of Metro Coaches . The Company must be an assembler / integrator or a manufacturer of Metro Coaches and should have successfully supplied minimum 100 coaches to the metro projects in India. Nomination is Closed! This award is for excellence in supply of Lifts and Escalator Systems or Installation and Commissioning of these Systems . The Company must be a Manufacturer and Supplier of Lifts or Escalators or In charge of Installation and Commissioning of Lifts and Escalator Systems in Rail, Metro and Station Sector. Nomination is Closed! Applications for this Award category is open for all suppliers and solution providers in the rail and metro sector in the Indian market that that have successfully demonstrated or supplied an innovation solution or product and achieved Innovation in their field of expertise. This award is for new innovation in important parts utilized in under frame of rail and metro coaches done by an Indian company . The Company must be a Manufacturer / Supplier of parts utilized in the underframe of rail and metro coaches and must have successfully demonstrated or supplied a new innovative product / solution to increase efficiency or reduce costs or enhance safety levels of the coaches . Nomination is Closed! This award is for a new innovation in Testing Systems or Certification of products , civil projects utilized in rail and metro sector done by an Indian company . The Company must be a Manufacturer / Supplier of Testing systems or Certifier of Quality of Products utilized in the rail or metro and must have successfully demonstrated a new innovative solution / technique or product to improve existing practices . Nomination is Closed! This award is for a new innovation in HVAC Systems utilized in rail and metro sector done by an Indian company . The Company must be a Manufacturer / Supplier of HVAC systems utilized in the rail or metro coaches or stations and must have successfully demonstrated a new innovative solution / technique or product to improve existing practices and increase efficiency . Nomination is Closed! This award is for a new innovation in Glass products utilized in rail and metro sector done by an Indian company . The Company must be a Manufacturer / Supplier of Glass products such as windows , windshields , glass products utilized in the rail or metro coaches or stations and must have successfully demonstrated a new innovative solution / technique or product to improve existing practices, reduction I costs or increase in efficiency . Nomination is Closed! This award is for a new innovation in Cabling products and systems utilized in rail and metro sector done by an Indian company. The Company must be a Manufacturer / Supplier of Cables utilized in the rail or metro coaches or stations or in catenary systems and must have successfully demonstrated a new innovative solution / technique or product to improve existing practices and increase efficiency . Nomination is Closed! This award is for a new innovation in Lighting Solutions utilized in rail and metro sector done by an Indian company . The Company must be a Manufacturer / Supplier of Lighting solutions utilized in the rail or metro coaches or stations and must have successfully demonstrated a new innovative solution / technique or product to improve existing practices and increase efficiency . Nomination is Closed! This award is for a new innovation in Seats or Seating Solutions utilized in rail and metro sector done by an Indian company . The Company must be a Manufacturer / Supplier of Seats or Seating solutions utilized in the rail or metro coaches or stations and must have successfully demonstrated a new innovative solution / technique or product to improve existing practices, provide more comfort to passengers and increase efficiency . Nomination is Closed! This award is for a new innovation in Steel Products and its variants , Stainless Steel Products and Solutions utilized in rail and metro sector done by an Indian company . The Company must be a Manufacturer / Supplier of Steel / Stainless Steel Products utilized in the rail or metro coaches or stations and must have successfully demonstrated a new innovative solution / technique or product to improve existing infrastructure practices, lower cost an and increase efficiency . Nomination is Closed! This award is for a new innovation in Rolling Stock Components utilized in rail and metro sector done by an Indian company. The Company must be a Manufacturer / Supplier of important rolling stock parts / assemblies or sub-assemblies utilized in the rail or metro coaches and must have successfully demonstrated a new innovative solution / technique or product to improve existing practices, reduce costs or increase operational efficiency . Nomination is Closed! This awards category represents a Significant Breakthrough and Achievement which has been very vital for the Company as well as in the growth of the rail and metro sector of India . Applications for this Award category is open for all suppliers and solution providers in the rail, stations and metro sector in the Indian market that that have successfully achieves a significant milestone after great effort in their field of expertise. This award is for achievement in supply of track solutions utilized in rail and metro sector done by an Indian company . The Company must be a Manufacturer / Supplier of Tracks or Track Parts or Sleepers utilized in the rail or metro projects and must have successfully achieved a milestone by supplying them in the rail sector . Nomination is Closed! This award is for achievement in Import substitution of any product / service utilized in rail and metro sector done by an Indian company . The Company must be a Manufacturer / Supplier of products / solution utilized in the rail or metro projects and must have successfully achieved import substitution through their achievement in development and supply of the product at more economical prices. (The units manufacturing under the Make In India policy will be given preference . Nomination is Closed! This award is for achievement in New Technology of any product / service utilized in rail and metro sector done by an Indian company . The Company must be a Manufacturer / Supplier of products / solution utilized in the rail or metro projects and must have successfully introduced a new technology through their achievement in supply of the product / services. Nomination is Closed! This award is for achievement in Significant contribution to Indian Railways by supplying or providing any solution of any product / services for the railway sector by an Indian company since the last 30 Years or more. The Company must be a Manufacturer / Supplier of products / solution utilized in the Railway or metro projects and must have successfully introduced the product / solution for providing more comfort and safety to the Railway operations. Nomination is Closed! This award is for achievement in supply or installation and commissioning of Solar Panels or Solar utilized in rail and metro sector done by an Indian company . The Company must be a Manufacturer / Supplier / Integrator of Solar Panels , Modules , Batteries or Transformers or Solar Project solutions utilized on top of the rail or metro coaches or stations, to reduce costs and provide increased efficiency. Nomination is Closed! This award is for achievement in Exports to Foreign Countries of any product / service utilized in rail and metro sector done by an Indian company . The Company must be a Manufacturer / Supplier of products / solution utilized in the rail or metro projects and must have successfully achieved exports to a foreign countries through their achievement in supply of the quality product meeting the International standards and technical specifications required by the overseas buyers. Nomination is Closed! This award is for achievement in Services to Railways utilized in rail and metro sector done by an Indian company . : The Company must be a Service Provider / solution provider in the rail or metro projects and must have successfully achieved a milestone for providing technical or commercial or management or consultancy service to the railways . Nomination is Closed! This award is for achievement in IT Solutions to Railways utilized in rail and metro sector done by an Indian company . The Company must be a IT Solution / Service Provider in the rail or metro projects and must have successfully achieved a milestone for services to the railways by increasing efficiency, better control and providing valuable information for flawless management . Nomination is Closed! This award is for achievement in Tunneling Solutions to Railways utilized in rail and metro sector done by an Indian company . The Company must be a Tunneling / TBM Solution or Service Provider in the rail or metro projects and must have successfully achieved a milestone in tunneling in India in the rail / metro sector in terms of time taken to do a particular project and providing world class workmanship. Nomination is Closed! 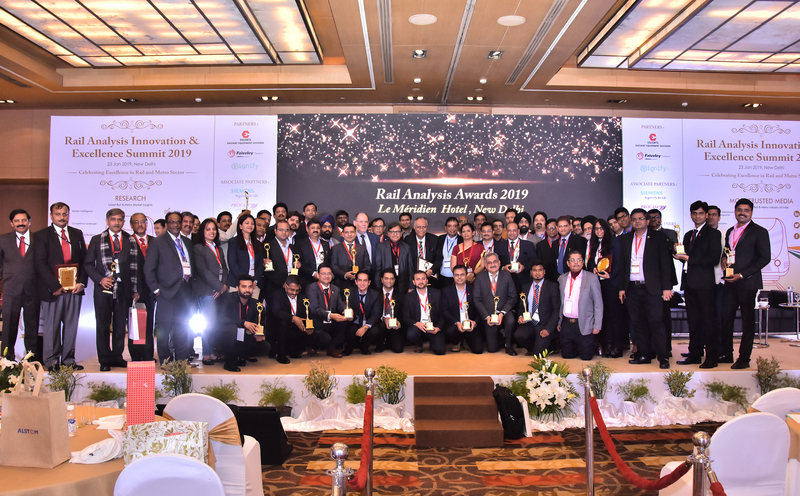 This awards category represents recognition by Rail Analysis Team for Achieving , Innovation and Excellence in their area of expertise in the Rail and Metro Sector of India . Applications for this Award category is open for all suppliers and solution providers in the rail and metro sector in the Indian market that that have successfully achieved , innovated and excelled in their field of expertise. This award is for the Company which has scaled new heights through their Solutions utilized in rail and metro sector in 2018 . The Company must be a Leading Manufacturer / Supplier of products / solutions utilized in the rail or metro sector and their team should have successfully set the benchmark for quality, delivery and project execution in a record time. Nomination is Closed! This award is for the Woman who has led her company from the front and managed to ensure its rise and consistency through their Integrated Solutions utilized in rail and metro sector in 2018 . The Individual must have successfully set the benchmark for Leadership through the achievements and growth of her company and made unmatchable contributions in taking the Railway Industry to a new level. Nomination is Closed! This award is for the Man who has led his company from the front and managed to ensure its rise and consistency through their Integrated Solutions utilized in rail and metro sector in 2018 . The Individual must have successfully set the benchmark for Leadership through the achievements and his unmatchable contribution to the Railway Industry, which should be an unsurpassable example within itself . Nomination is Closed! It is one of the most important occasions offering over 250 finest railway professionals, the chance to meet each other, network with their competitors who are striving for award winning performances through their innovative ideas, hard work and determination to succeed in the industry. 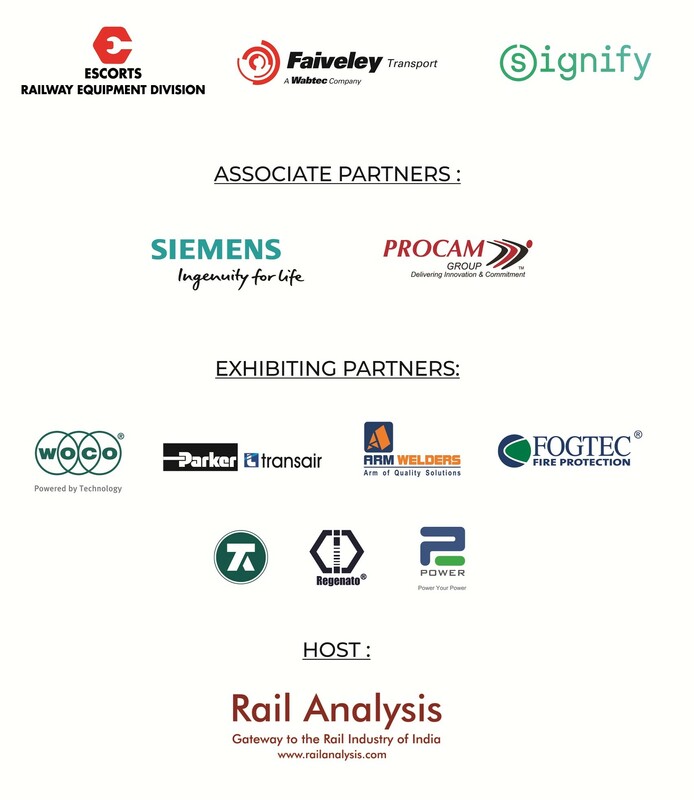 The Rail Analysis Innovative & Excellence Summit is an event to celebrate and honor the known and unknown personalities, technologies, innovative projects & products from companies that have taken the Railway Industry to unbelievable heights. Applicants must be private companies and MNC’s registered in India. All the applicants should be either manufacturers, service providers , consulting firms , experts associated with the metro and rail sector ( passenger , freight and stations ) of India. There are no financial changes for submitting your application for staking your claim to win the award. All small scale, medium scale or large scale industries / organization / service providers are eligible to participate. To win, you have to be innovative, creative and be one above the rest in whatever you are doing for the railways, irrespective of your size, experience or your turnover. Each company can make maximum 4 nominations in 4 different categories, as each relevant category has variable criteria, accordingly your submission must be in relevance to the concerned category. The last date of the Nomination can be extended by the organizers. Every company must comply with the criteria mentioned under “Eligibility Criteria for All Awards ." It is assumed that all nominations for innovative, excellence and achievement awards must be of the genuine and original work done by the company and the proof can be asked for, if required by the organizers. The nominator will provide the necessary information in respect to his nomination if required by the organizers, during the process of short listing / voting or selection of the potential winner. The organizers can disqualify any nominator during shortlisting / voting or final investigation to select the deserving winner. The decision of the organizers in selection of the award winner is final and binding. The achievements of an employee or manager or company from Indian railway sector, whether front-line or behind the scenes, in managerial, commercial, operational or engineering roles. To identify the right company providing functions relating to rail business management, development or service delivery, whether customer-facing or behind the scenes. Passion and drive for working within the rail industry. Leadership and direction at any level within their company. Dedication to the development of their company’s business. An ability to identify and deploy the appropriate digital technologies to address specific rail applications, including the use of software as a service where appropriate. A strong business strategy with clear objectives, implementation and adherence to budget. Efficient planning of the work to maximize overall benefits and minimize any impact on the operational railway. The introduction of innovative materials, techniques or systems to enhance project performance and deliverability. Innovation in product or service delivery to improve efficiency or quality of service. A reduction in the cost of rail operations to ensure better value for money. Communication effectiveness and the originality of the messages and materials. . The business benefits of the campaign, including enhancement to reputation and awareness, improved organizational behavior, industrial relations and/or business performance. A leader who has contributed to the growth of market share or development of new business for their organization. Email us at event@railanalysis.com or call us at +919811979598 / + 919811979599 for more details . Be a part of the Rail & Metro Sector Event Today .